The 2014 World Cup has been thrilling, dramatic, and awe-inspiring with the marvelous athleticism of the globe's top soccer players engaged in games that are simply riveting. Brazil deserves our congratulations for uniting the world as we watch the beautiful game being played at its venues. I know of two colleagues in Operations Research who have tickets to several of the games in Brazil and I hope to catch their faces on TV at upcoming matches, Dr. Celso Ribeiro, the Editor of the journal, International Transactions in Operational Research (ITOR), and Dr. Mauricio Resende, of AT&T. This year, as in 2010, 2006, and even 2002, I have been spending weeks during the spring and summer out of the USA, and those have also been World Cup years. In 2002, I was living with my family in Innsbruck, Austria, where I held a Distinguished Fulbright at the SOWI Business School at the University of Innsbruck. Brazil won the tournament that year, beating Germany. In 2006, which was my sabbatical year at Harvard, I traveled to Limassol. Cyprus, to speak at the 12th International Conference on Computing in Economics and Finance, June 22 - 24, 2006 and then to Iceland, for the 21st European Conference on Operational Research, Iceland, July 2-5, 2006, and, finally, to Erice, Sicily, to give an invited talk at the INTERNATIONAL SCHOOL OF MATHEMATICS G. STAMPACCHIA 44th Workshop: VARIATIONAL ANALYSIS AND PARTIAL DIFFERENTIAL EQUATIONS, Erice, Sicily, July 5-14. I was with many operations researchers in Erice, when Italy beat France in the 2006 World Cup, an experience we will never forget because of the celebrations that followed and somehow I made it back the next day via Alitalia to Boston and with my hearty congratulations to the staff got upgraded to Business Class! The below photo is of several of the Erice workshop participants, including Professor Panos Pardalos of the University of Florida, watching the final game! In 2010, we were in Buenos Aires, Argentina, for the great ALIO-INFORMS Conference. The World Cup that year was taking place in South Africa. Buenos Aires was replendant in celebrating its team. Spain won that year (and got eliminated early in 2014). Coincidentally, Dr. Celso Ribeiro gave a tutorial on sports scheduling at this conference, with a focus on soccer, which I enjoyed very much. A special issue of ITOR was edited on the tutorials and I also had one with Q. Qiang. I have spent almost 2 of the past several months in Europe, being based primarily in Sweden (which did not, however, qualify for the 2014 World Cup). I have also been going to conferences in Erice (deja vu), in Taormina, also in Sicily, and in Greece. I have met up with may operations researchers at these venues and together we have cheered on many teams. I enjoy listening to the announcers in different languages. 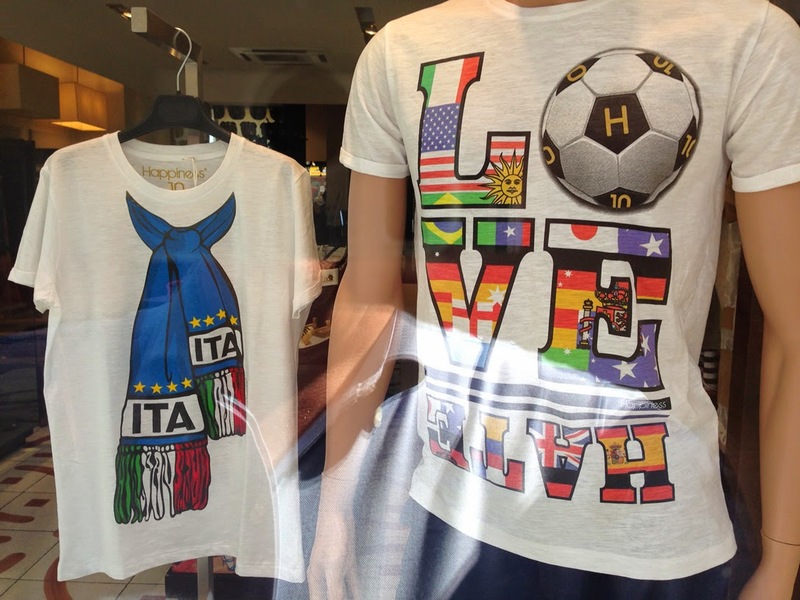 The photo below was taken in Italy about 2 weeks ago, shortly before Italy was eliminated from the 2014 World Cup, and we commiserated with our many Italian friends. I was disappointed that Greece lost last night especially since Greece was the most recent country at which I was at an operations research conference and it was a truly special one - as readers of my blog know. We recently celebrated Professor Pardalos' 60th birthday with a conference in Chalkidiki, Greece, at which I took the photo below, from the ferry. Many more photos are here. The Costa Rican goalie, Keylor Navas, who was instrumental in Costa Rica beating Greece in last night's game, has made headlines with his amazing plays. Afterwards, I enjoyed his quotes, in which he emphasizes his family (and how he kept on thinking of them during last night's game against Greece): I try to be a good father. I tried to be a good friend and in such a beautiful sport as football, I always try to have my kids happy so when they grow up, they can look back and they can see a father who did important things for their country. It is great that the USA has made the round of 16, although it lost to Germany in its latest match, and tomorrow it will be very exciting to watch the USA team play against Belgium. Congratulations to all of the teams that qualified for this terrific 2014 World Cup in Brazil! Sweden is one of the most egalitarian societies in the world and, perhaps, that is another reason why I so much enjoy living in Sweden whenever I have an opportunity to. I have been lucky to hold a Distinguished Visiting Professorship at the Royal Institute of Technology (KTH) in Stockholm, and am now in my third year as a Visiting Professor at the School of Business, Economics and Law at the University of Gothenburg. The latter commitment involves a multiple weeks in residence, which I thoroughly enjoy. Sweden has generous parental leave policies, among other policies, that support both men and women. And my male colleagues at the university enjoy taking parental leaves and are very serious about them. This makes for a wonderful professional and personal climate. Over the past several days, while walking to lunch in beautiful Gothenburg, or just doing errands, I decided to take photos of men pushing strollers because I love this aspect of Swedish culture. Men, women, and children all benefit from such a supportive set of governmental policies! It is officially summer here in Sweden, but, after having spent time in Sicily and Greece recently at fabulous conference, I do find it a bit chilly. But the air is fresh and it is great for working and even doing some exploring. Those of you who are familiar with Swedish culture know that the Swedes celebrate the beginning of summer in grand fashion. The long daylight hours are also wonderful! This past weekend, we had the pleasure of taking a train to the outskirts of the city of Gothenburg and we were treated to moose stew, made from a local moose, by a colleague of mine. The trick we were told is cooking the moose meat long and adding, would you believe, bacon, beer, and heavy cream. Our hosts took us on a long afterwards and we saw not only their 4 horses but the beautiful lake nearby, which is captured in the photo below. After the trek we had homemade apple rhubarb pie with vanilla cream - heavenly! What I love about living in different countries and I have been very lucky to hold Fulbrights and various Visiting Professorships (in Sweden, Austria, and Italy) that enable me to do this, is the serendipity of new experiences, sights, people, and adventures. Being out of your usual comfort zone also fuels one's creativity and I love working with new collaborators! Below are scenes from recent events in Gothenburg, Sweden, that I just stumbled upon when going to lunch or doing errands - from parades to a fashion show in Haga to waffles with blackberries being made and served outdoors to Mama Duck with her ducklings in my favorite park here, Schlottskogan. 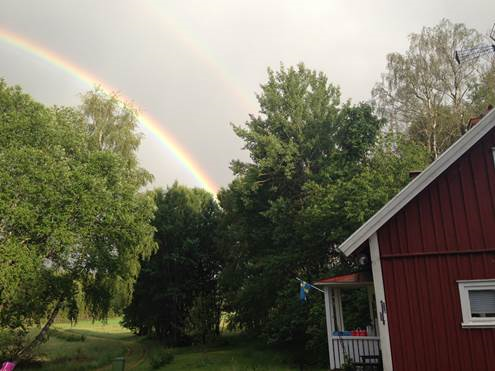 And the photo below was emailed to me by a wonderful administrative assistant here at the School of Business, Economics and Law at the University of Gothenburg, who had taken the photo of the double rainbow last weekend over their summer home, which is a traditional Swedish red house. She told me 20 slept there together last weekend from children to grandmas. On July 5th, Professor Martin J. Beckmann, Professor Emeritus of the Department of Economics at Brown University, my alma mater, will be turning 90! I bought him the birthday card featured on the right in Gothenburg, Sweden yesterday and today wrote him a long letter and posted it to him. I was rather thrilled to find such a perfect card. 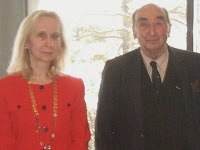 I last saw Professor Beckmann in January 2010 at a special symposium organized in his honor by Professor Hani S. Mahmassani at Northwestern University at which the photo below was taken. Beckmann's presentation at the symposium inspired one of my recent papers, Design of Sustainable Supply Chains for Sustainable Cities,in press in Environment & Planning B, and the follow on paper, Supply Chain Network Sustainability under Competition and Frequencies of Activities from Production to Distribution, co-authored with my former doctoral student, Professor Min Yu of the University of Portland, and my Gothenburg colleague, Professor Jonas Floden, which was published in the journal, Computational Management Science. Beckmann was on my doctoral dissertation committee at Brown University, along with the chair of my committee, Professor Stella Dafermos, and Professor George Majda. Sadly, Stella died at age 49 and George at age 51, but Martin soldiers on. I will never forget sharing a delicious Ukrainian torte with him after my dissertation defense and his comments on the Braess paradox during my defense. I have met Martin on various continents and always treasure our meetings and his brilliance. When in Australia, just after my first book - Network Economics: A Variational Inequality Approach, was published in 1993 and I handcarried a copy to a conference in Mallacootta (in the outback), I gave a presentation at around 9 o'clock (PM), since we had had a tour. I actually thought that Martin was asleep but then he corrected a missing minus sign on my transparency and he was right - I was speaking on the latest work that I had done with Paul Dupuis on projected dynamical systems. Martin had been traveling the world that year giving talks in many different countries and, as always, enjoying great food, music, culture, sights, and people. I have created a page on the Supernetwork Center site with information on Beckmann's classic book, Studies in the Economics of Transportation, published in 1956 by Yale University Press, and co-authored with C. Bartlett McGuire (1925-2006) and Christopher B. Winsten (1923-2005). On the page, there are links to presentations and to his book and also photos. Also, we wrote the paper, D. Boyce, H. Mahmassani, A. Nagurney (2005), A retrospective on Beckmann, McGuire and Winsten’s Studies in the Economics of Transportation, Papers in Regional Science 84, 85-103, and a preprint is available here. Beckmann's research revolutionized the modeling of travel behavior on congested urban transportation networks and is utilized in transport planning around the world to this day! Its impacts on the understanding of other networks, including electric power generation and distribution networks and even complex logistical networks and supply chains, has been profound. He is the recipient of numerous well-deserved awards, including the Robert Herman Lifetime Achievement Award in Transportation Science, given by the TS&L Society of INFORMS and being elected a Fellow of the Regional Science Association International (RSAI). We are indebted to Professor Martin Beckmann for his genius, friendship, and love of life! And, I just heard from Professor David E. Boyce that today, June 24, is his birthday, so Happy Birthday also to Professor Boyce, another amazing scholar, mentor, and friend to many! It has been fabulous to be back in Sweden where I am continuing my third year appointment as a Visiting Professor at the School of Business, Economics and Law at the University of Gothenburg. I arrived in Europe on May 11. Being based in Europe for a couple of glorious weeks allows for some great conference chaining which I have been doing and have also been highlighting on this blog in several previous posts. There has also been a North South theme to this visit since I have given talks at workshops and conferences, since my arrival, in Erice, Sicily (south), came back to Sweden (north), then ventured to Taormina, Sicily and Catania, also in Sicily (south) and onwards to Chalkidiki, Greece (south). Back in the north now in Gothenburg. As a researcher and a very frequent flier, who also works on networks and their numerous and fascinating applications, including transportation and communications, practical, real-world experiences reinforce my research and vice versa! Plus, you acquire great stories to share with your students in classes. Before flying to Europe, we were finishing up a paper on Delay Tolerant Networks, and, in the meantime, we have also completed another one. This is a collaboration initiated by a doctoral student in engineering, who is from Colombia, and who is visiting my Co-PI on our National Science Foundation project, Network Innovation Through Choice, Professor Tilman Wolf of the College of Engineering at UMass Amherst. The doctoral student is Luis Marentes and he sat in on my SOM 825 course this past semester on Variational Inequalities, Networks, and Game Theory. In the beautiful parts of southern Europe - I can't resist sharing some photos of Sicily and Greece where I spoke at below, there, nevertheless, were major issues with the Internet! Even when it was up it might take as long as an hour to access an email message and, as for tweeting 140 characters, sometimes we waited for 24 hours, and the tweet was still not transferred. But we were patient and the beauty and the caliber of the conferences and people made up for the technology shortcomings. I will share a story at the end of this post. Our work on Delay Tolerant Networks, is inspired, in part, by that of Dr. Alex "Sandy" Pentland of MIT, whom we have hosted at the Isenberg School of Management at UMass in our INFORMS Speaker Series, and whom I have interacted with on other occasions. I am a huge fan of Sandy's and was thrilled when he was ecleted to the National Academy of Engineering this year. Pentland's paper, DakNet: Rethinking Connectivity in Developing Nations, published in Computer in 2004, speaks of connecting remote villages in India and Cambodia through a combination of wireless and asynchronous means. When I tell people that there are parts of the globe in which residents desperately need information that we take for granted and that which we access through the Internet but they lack digital connectivity because of market and pricing forces (including poverty) and can benefit from using transportation modes (from busses to mules - I am not kidding) to secure the information, I receive expressions of shock! In our first paper, "Overcoming Economic Challenges of Internet Operators in Low Income Regions Through a Delay Tolerant Architecture with Mechanic Backhauls," Luis Marentes, Tilman Wolf, Anna Nagurney, Yezid Donosoa, and Harold Castro, we study the following. Regions with low population densities and low income, which may be rural, are far behind in Internet access as compared to their urban counterparts. Economic unsustainable deployments have been suggested as one of the factors with high negative impact. Researchers using the Delay Tolerant Network Architecture (DTN) have established a less expensive alternative, but they do not provide guidelines on how to price the new possible services nor any indication as to operators’ profitability. These two points are the contributions of this paper. Based on a continuous pricing model, we show that projects using the DTN architecture have a positive net present value using real demand data. In this paper, we also explore how far the use of this technology is going to help in attaining profitable deployments with real and delay tolerant services. Our findings indicate that although it is not possible to support the investment reported in a previous actual deployment, a great portion of the investment is actually covered by the predicted gross profit of our model. We hypothesize that the remaining value is affordable if service differentiation is enabled by means of a new architecture. Three components to test the hypothesis are introduced: (1) the pricing elements to form service level agreements, (2) a general overview of the architecture requirements, and (3) a novel pricing model. In this regard, our results show a positive effect of service differentiation which improves profits by 10% without any customer additional payment. In our second paper, "Towards Pricing Mechanisms for Delay Tolerant Services," Luis Marentes, Tilman Wolf, Anna Nagurney, and Yezid Donoso, we again note that one of the applications of the Delay Tolerant Architecture (DTN) is rural networks. For this application researchers have argued benefits on lowering costs and overcoming challenging conditions under which, for instance, protocols such as TCP/IP cannot work because their underlying requisites are not satisfied. New responses are required in order to understand the true adoption opportunities of this technology. Constraints in service level agreements and viable alternative pricing schemes are some of the new issues that arise as a consequence of the particular operation mode. In this paper, we propose a novel model for pricing delay tolerant services, which adjusts prices to demand variability subject to constraints imposed by the DTN operation. With this model we also show how important parameters such as channel rental costs, cycle times of providers, and market sensitivities affect business opportunities of operators. In both of these papers, the consumers respond to the average time of the delivery of the services, which could consist of a combination of communication and transport modes! As for our journeys in southern Europe, we ended up, in Chalkidiki, Greece taking the ferry to the neighboring town of Marmara (transport) and back to seek a decent WiFi connection. And we were successful. Decent WiFi was found at a restaurant at which we also had a fabulous meal - it was so good that I blew kisses to the cooks and then they surprised us with a tray of fresh cherries and exotic, delicious Greek desserts! We then, the next day, explored another mode of transport to access the Internet - we walked rather than taking the ferry to Marmara and it took us about the same amount of time - plus the beach views were glorious. And for those news junkies there, we even found a small shop where we purchased the same day edition of The International New York Times, which was printed in Greece. The owner is British. How We Celebrated a Superstar Operations Researcher's Birthday in Super Style - Congrats and Thanks to Professor Panos M. Pardalos! This week a truly extraordinary conference is taking place in Chalkidiki, Greece, which I had the honor and privilege to speak at. The conference, Optimization, Control and Applications in the Information Age, is in honor of the superstar operations researcher, the scientist Professor Panos Pardalos of the University of Florida, who has received numerous deserved accolades. The conference consists of single tracks, so we are all together, which makes for lively exchanges and cameraderie, plus the program is fantastic from theoretical advances to applications ranging from the modeling of brush fires and debris flows (and damage minimization through mitigation) to network modeling of vaccine dissemination to supply chain network competition for time-sensitive products, as an illustration. The full program is available here. We traveled many miles to get to this location, flying in from around the globe to the Thessaloniki Airport, and then driving (or being driven by taxi) to the conference venue which is on the Mediterranean Sea. The conference is celebrating the 60th birthday of Panos and is organized by Professors Sergiy Butenko of Texas A&M University and Sakis Migdalas, now of the University of Lulea in Sweden. We thank them for putting this remarkable conference together! Since I know that my readers are eager for photos, below I share some with you. The above photo is of Dr. Dmytro Matsypura, who was my PhD student at the Isenberg School, and who traveled with his wife (for 48 hours) from the University of Sydney in Australia! The above photo is of Professor Pardalos with his former doctoral students who were at this terrific conference. We thank Professor Pardalos for being the extraordinary scholar and leader in operations research, who has been a mentor to many! Happy birthday, Professor Panos Pardalos - we wish you many more wonderful years as a scholar, educator, and fabulous human being! Thank you for building such an exceptional community of operations researchers and optimization experts! And, as we were getting ready to return to Sweden, where I am spending several weeks, as part of my Visiting Professorship at the University of Gothenburg, I could not help but have the photo below taken with Professor Alla Kammerdiner, who is a heroine, having run the 2013 Boston Marathon and who continues to run marathons. She spoke on cyber-physical systems and helping the aged minimize falls and injuries. Doing Good with Great Operations Research is what gives us all great joy. Alla's t-shirt states: Love is the New Red! As I tell my students, work hard, and you will travel to amazing destinations and meet incredible people! As for more good news, Professor Oleg Prokopyev's suitcase (from the University of Pittsburgh, which was traveling through Boston and Istanbul) finally arrived after 3 additional days in transit. His friend, Dr. Matsypura, in the meantime, had gone with him on the ferry to the neighboring town of Marmara, to buy the nice t-shirt below! Safe travels, everyone, and enjoy the journey!